Three things come to mind: a security breach or theft, a major retailer warning against its patchy record as a method of payment, and a cooling of Wall Street&apos;s already frosty view of the coin. So far this week, all three have happened. Yet Bitcoin simply doesn&apos;t care. Its price has now crossed the $15,000 threshold, double where it was trading only a month ago. What does this tell us? 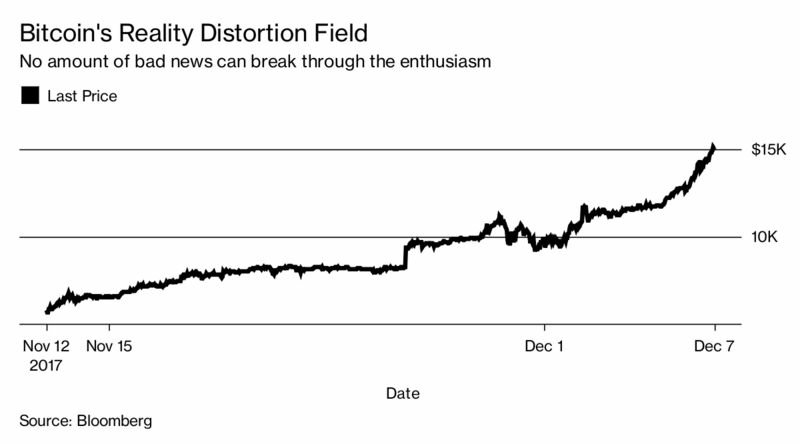 Firstly, that the reality distortion field surrounding Bitcoin — a craze that reflects a broad desire to get rich, beat the establishment and take back control of the financial system — is expanding. Hacks and thefts, such as the $31 million recently reported stolen by Tether, have hurt the currency&apos;s price in the past, but no longer. Markets barely blinked at Wednesday&apos;s news that NiceHash, a cloud-based crypto mining firm, had been hacked for, according to CoinDesk, more than $60 million. Secondly, the surge in the price of the crypto-currency has nothing to do with its real-world adoption, despite the mountains of propaganda from evangelists arguing that Bitcoin is the future of money. The largest online gaming shop in the U.S. and Europe, Steam, said Bitcoin had become "untenable" as a method of payment because of its volatility and transaction fees that can be as much as $20. That sounds a lot like Bitcoin becoming less useful as a method of payment, rather than the reverse. Yet, again, it doesn&apos;t seem to matter. Thirdly, that this is an illiquid market where there are only buyers — for now, at least. One trader reports that orders for hundreds of Bitcoin are being executed in a matter of minutes, even at these eye-popping price levels. But what would a really big Bitcoin sell order look like? 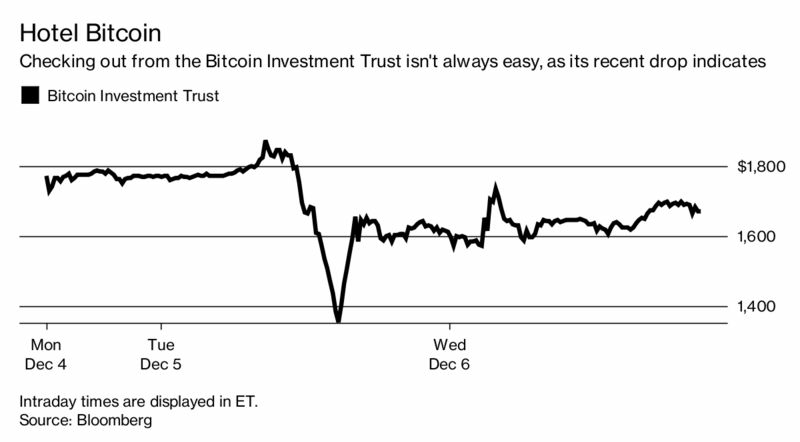 The Bitcoin Investment Trust, which offers funds the chance to profit from the cryptocurrency&apos;s price moves without directly holding it, is one clue. It lost 25 percent of its value in a few hours on Tuesday, when there was no comparable move on Bitcoin itself. The stock still hasn&apos;t fully recovered. If the push to launch Bitcoin futures is still-born, or strangled at birth by Wall Street, that could spook traders buying today in the hope of a more liquid market tomorrow. Talk of fundamental value is beyond parody at this point. Everyone is throwing around bombastic price targets, from $40,000, to $400,000, to more than $1 million. If people want to buy something whose supply is structurally and speculatively capped, whether by rules or by people who hoard most of what they collect, then you can expect all sorts of prices in future. But if the herd panics and sells, prepare for pain.